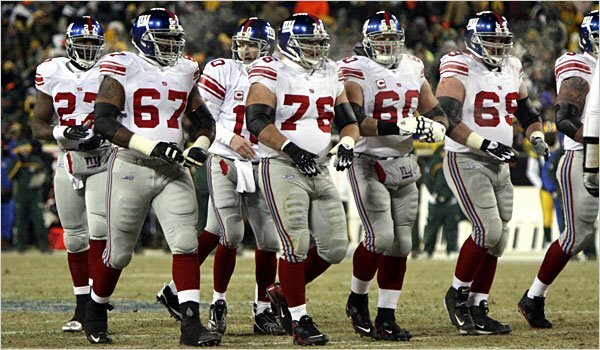 McKenzie, Snee, O’Hara, Seubert, and Diehl (out of picture) break from the huddle. AND FIVE OFFENSIVE LINEMEN WHO PLAY AS WELL TOGETHER AS WE HAVE SEEN SINCE PRE-FREE AGENCY. The stats are gaudy. The Giants are third in the league in (lowest) sacks allowed, slightly less than one per game. The #1 Rushing Offense in the NFL. The #3 Overall Offense in YPG. #2 in Time of Possession. Back to the offensive line, these guys have ALL been with one another for four consecutive seasons 2005-2008. Diehl 2003. Seubert (essentially back from injury in) 2005. O’Hara 2004. Snee 2004. McKenzie 2005. To say these guys have their communication down is an understatement. To watch them vs the Steeler blitz was impressive. Air tight. This is what I miss from pre-free agency, an offensive line that works as a unit. Continuity. Consistency. High level of play. The Giants organization understands this, although I certainly had plenty of doubts about Accorsi when Fassel was around. They relied way too much on McNally to put together patchwork and ignored the OL for cap reasons. I contended that McNally’s presence was a crutch for the organization, because the allocation of resources their dwindled with every successive miracle McNally performed. McNally was practically Dr. Frankenstein, manufacturing linemen in his basement. (Seubert was one those who still remains). You have to give Accorsi/Reese/Coughlin the credit for their work over the past four years in trying to keep these guys together. THE BOTTOM LINE IS THE FIVE MEN AS A UNIT ARE GREATER THAN THE SUM OF THEIR PARTS. And they would be the first ones to tell you that. Simms this past Sunday singled them out as the reason why the Giants would win the game. Indeed, they were the difference. Lack of depth at Tackle is the only blemish on this story. As long as Diehl and McKenzie are healthy the Giants OL should be fine, because we saw that Ruegamer can come in and plug the inside. Let’s remember, the offensive line was the single most consistent unit last year also. And the OL is playing better than last year, if that is at all possible. This weekend we get to see Diehl vs Ware. As long as the OL stays healthy the Giants are one of a handful of teams that can vie for the title. This entry was posted on October 30, 2008 at 10:00 am and is filed under Chris Snee, David Diehl, Kareem McKenzie, Rich Seubert, Shaun O'Hara. You can follow any responses to this entry through the RSS 2.0 feed. You can leave a response, or trackback from your own site. It certainly is nice not having to hear the tones of Bob Shepherd chanting, “Holding…# 77 Luke Petitgout”We haven’t had a Pro Bowl OL since the days of Ron Stone. I think that will change this year with Chris Snee and possibly Sean O’Hara. Gotta agree with you Andy. This O-line is reminiscent of the Suburbanites of 1986 -Bart Oates, Chris Godfrey, Brad Benson, Karl Nelson and Billy Ard. Those guys were a solid unit, who developed a real feel for what one another was doing on any given play. Simms was able to get the time he needed on passing plays. Joe Morris had some nice creases to run through. It was a beautiful thing to watch on Sundays. These guys are very similar. Here, here on the shout out to Brad Benson & Company. (The chronically broken nose will always be a classic Giants image.) I do think this group is the best we've had since then.I think Ron Stone took the pro bowl with him wherever he went. And after a while I had the sense he got it because he'd gotten it before.The red zone statistic is very striking when put in that context. Red Zone has been a problem for a long long time. I have confidence that the problem will be fixed very shortly. Our last TD might have been our first step in correcting this problem. And I don’t blame Gilbride for that problem, just as I don’t give him the credit for the other good things the offense has done. Its a team thing. BTW: time of possession is crucial for this team. as a long time giant fan we are used to crushing dynamic defenses, good special teams, and average offenses with maybe a good running fame. this is the first i can recall having a top elite offense. the best part is we do this with a great running game. we only need to improve the green zone to leap to the top. Thanks for reminding me about Brad Benson’s broken nose. It was significant because that was what the “Suburbanites” were. A real “Lunch Pail Group” as Parcells would call them. I also seem to remember that Brad named his dog “Dexter” because of his batlles with the Redskins’ “Secretary of Defense”, Dexter Manley. That’s certainly better than Kerry Collins, who named his dog “fiver” after the number of picks he threw in the Super Bowl. I’ll not dispute your numbers. ButThe OL got their butts kicked in Cleveland.Even with the Gilbride anchor if the OL was as dominant as you say they would score more TDs, especially when they are inside the 5 yard line.Joe Morris would get into the end zone untouched. The OL did not get their butts kicked in Cleveland. The DL/blitz packages got their butts kicked. And Manning was old Eli that day. The OL was its consistent self, giving up one sack and enabling Ward (100 yds) to run wild, a total of ~170 yards on the ground that game.If you are trying to imply that Joe Morris would have been more effective than Brandon Jacobs, amen, that is exactly the point, they have the wrong RB in short yardage/red zone. This whole conception of Jacobs as some sort of short yardage hammer is an outgrowth of the days when Tiki was the premier back and they needed a role for Jacobs. The problem with Jacobs in short yardage and red zone is that he takes forever to get back to the line of scrimmage or wide, the speed of which is at a huge premium in that area because of the close proximity to the line of scrimmage of all defenders. Ward/Bradshaw (or Joe Morris) will get outside or back to the line of scrimmage and punch it in from the 1 because that 1/4 of a second is the difference between the extra foot or not. The last time I looked, Bradshaw looked more than capable in the red zone (4th and 1 vs SF at the 10, pickup of 8 yard on dumpoff pass at the 12 ran down to the 4 yard line vs NE in the Super Bowl… next play which was Tyree TD, TD vs Packers in NFC Championship.. he finds the hole, he hits the hole fast).